A weekend, a week or longer. 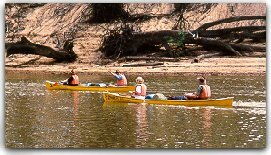 We deliver you upstream on the Murray River at Picnic Point, Tocumwal or Yarrawonga. 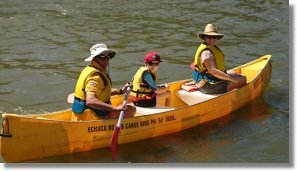 Or to the superb Barmah Lakes which boasts the world's largest stands of the majestic river red gum. Listen to the sounds of nature. Delight in the profusion of birdlife, the noisy cockatoos and Galahs, the laugh of the kookaburra. Absorb the peace and tranquillity of the world around you, the sound of a paddle as it rhythmically dips into the water. Or simply stop a while, catch a fish, and throw it on your camp fire. At night experience the splendour of our skies ablaze with stars so close you think you could reach out and touch them. The canoes are Canadian tourers with loads of inbuilt buoyancy, they are limited to two people plus gear. 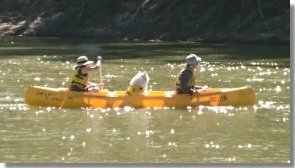 Buoyancy vests, Plastic Barrels, Canvass Duffel Bag, River Charts etc. are available. Click to see our ' Fantastic ' CAMPANOEING TRIP PRICING. Note: Bookings are essential for all Motor boats to avoid disappointment. 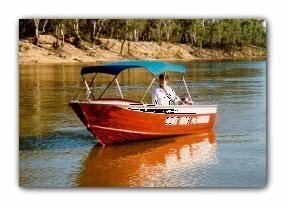 Aluminium boats which carry up to 6 passengers on cushioned seats, protected from the sun with a canopy which can be folded down. Easy to operate and powered by six horsepower outboard motors. No boat licence is required and all safety equipment and fuel supplied. Day Light Hours Only. Note: Bookings are essential for all barbecue ( BBQ ) boats to avoid disappointment. The ' Kenny ' BBQ boat is a larger version, and holds up to 12 people. It has an onboard gas BBQ, table and chairs, ice box and shade canopy. 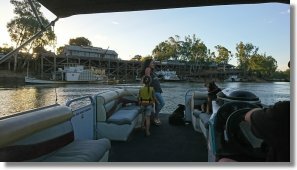 Note: Bookings are essential for all pontoon boats to avoid disappointment. The ' Splash Out ' pontoon boat holds up to 10 people. It has an onboard shade canopy. Fuel is provided in the price. 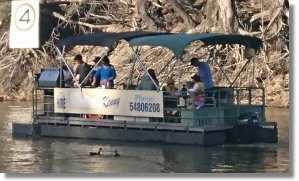 The Munchie pontoon boat holds up to 11 people. It has an onboard shade canopy. 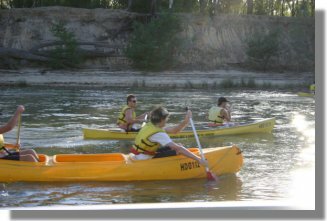 Our canoes are available in three different sizes with seating for 2, 3, or 4. We provide you with a water-tight container for your valuables ( watches, wallets, etc.) and a map of the river for reference. Kayaks with plenty of inbuilt buoyancy, carry one person, and cost $20 for the 1st hour then $10 for each hire after. Why own a boat, when you can hire one! Please NOTE - A current boat license is required for these vessels. 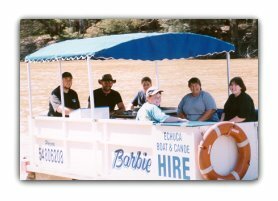 Minimum 2 Day Hire - current boat license must be presented.